How Did We Get Here? Week 1: Austin. It’s Monday morning, a few hours before our first trail crew is set to leave for the mountains, and our once quiet house is now buzzing. In total, sixteen people hailing from seven different countries are here, packing bags, preparing food, testing walkie-talkies, studying maps, and sending out a few last emails for the week. The Transcaucasian Expedition team from Armenia arrived a few days earlier with Ben, who flew in from England to film the whole affair, which only adds to the feeling that we’re actually backstage on the opening night of a Broadway show. The comparison feels apt, considering the production that went into making this moment. Countless scouting missions, meetings, and hours of planning have led us here, and in just a few hours, we’ll finally put our words into action. By tomorrow, we’ll be breaking ground on the first leg of the Transcausian Trail. 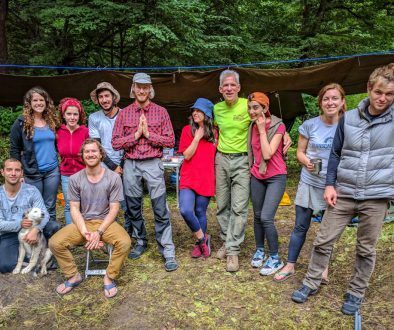 We set out to make a trail spanning the entire Caucasus, a project when finished that would bring people together who may have never met otherwise. Those people aren’t just the hikers from different countries but the people who live along the trail as well. Looking around at this flurry of activity, it strikes me that we’ve already achieved that vision, even before the first shovel hits the ground. Like the trail itself, our project is like a rope with a frayed end, its threads spreading in every direction before winding together tightly at the center. Each of us, our personal histories, the stories of how we arrived are those threads. When I think about mine, I’m often surprised that I even made it here. I was just a kid when I first moved to Georgia for the Peace Corps eleven years ago. I’d traveled growing up, but the experience of learning a new language and being immersed in a different culture immediately overwhelmed me. Things as straightforward as eating, exercising, and even sleeping were now testing the foundation of my worldview. It was no surprise then that after the first month, I was so stricken with homesickness that I packed my bags and put them by the door of my bedroom. I remember long afternoons staring at those bags, weighing my options. Returning to Oklahoma meant comfort and familiarity. Staying in Georgia meant marching into the unknown, a daunting if thrilling prospect. These weren’t decisions I’d ever had to make before, and I didn’t know what to do. My host family must have sensed it, or maybe they just saw the bags one day when I was out because the next day, they invited my friend over for a big meal in the hopes of cheering me up. I wasn’t really in the mood to socialize, but I couldn’t say no to such an act of kindness. That night after dinner and a few glasses of wine, my host mother, seemingly taken by the moment, jumped up from the table and started playing a lively waltz on the piano. My host father, a goofy and gregarious man, followed suit and took my friend by the hand to dance, a funny sight considering how much taller he was than her. It was somewhere then, as I was laughing and clapping to the music, I realized that going back home meant foregoing so many more memories like these. Since then, I’ve come to think of that moment as one of most important in shaping the course of my life. A few years ago, I sat a similar crossroads before choosing to pursue a career in writing fiction, a decision of which I’ve yet to fully understand the course and consequence. Regardless of any successes or failures though, I am grateful that I made the decision, and at the same time, indebted to my years living in Georgia. I’ve been connected to this place for a third of my life now. However small, my own history, culture, and politics are bound up here, too. Without that, my inspiration for writing would have never surfaced. When Paul asked me to join the TCT as the volunteer coordinator, I jumped at the offer, not just for the chance to come back to Georgia (I live in Berlin these days), but more importantly to be able to pay back something to a place that’s given me so much in return. Introducing Georgia to new people through the TCT felt like the right way to do that. Now, those people are here, packing their bags for the trail, filling the project with life, and wrapping their threads into our rope by marching happily into their own unknown future. I marvel at what it’s taken to get everything together at the right time and place to make this project happen. 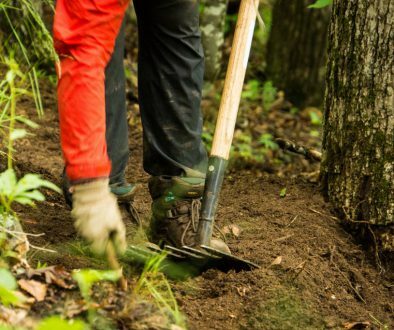 A lot of what goes into making the trail is the raw stuff: sweat, burnt calories, shovels digging dirt, picks breaking rock, and saws cutting wood. 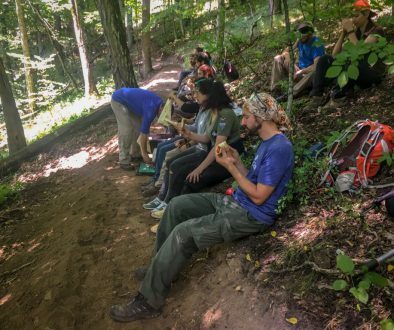 But at the same time it involves experience: trail-building expertise, crew leadership, knowledge of the topography, the culture, and language. Collectively, we’ve combined all that, making our rope stronger and tighter. For the next eight weeks, our project will bring together more people and places, and with them, the stories they carry. Each of these weeks, I’m going to profile another person that’s crossed our path, from the trail leaders and volunteers to the people who’ve greeted and hosted us along the way. After all, I think it’s how we all got here that makes the Transcaucasian Trail so compelling in the first place.